Shelby Cotham joined Copperhead in the spring of 2017 gaining full time status in 2018. She received a B.S. in Wildlife and Fisheries Science with a concentration in wildlife management from the University of Tennessee. 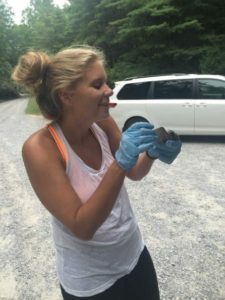 She began her career in bat biology in 2015 at UT assisting masters students studying roosting ecology of tri-colored bats and assessing the use of anthropogenic structures by bats in Great Smoky Mountains National Park. Shelby has assisted Copperhead with a variety of field surveys including mist netting for bats on the landscape, aerial and ground based telemetry, and hibernacula counts. In addition to bat surveys, Ms. Cotham has extensive experience in anuran surveys through the Tennessee Amphibian Monitoring Program. In her free time, Shelby enjoys hiking, sewing, and listening to podcasts.